Hello Amit, don’t waste your time; you can’t hack my system. But we will hack your country! Ameen. They know me! This wasn’t good. The greatest fear a hacker has is having his identity revealed. During investigative operations, I always guarded my identity like the Kohinoor diamond. Then how could they have reached me? It was a-l-m-o-s-t impossible. A young software engineer, who, as a hobby, starts helping the Police in solving criminal cases, turns into a critical resource for the Force. He becomes entrapped in the system. 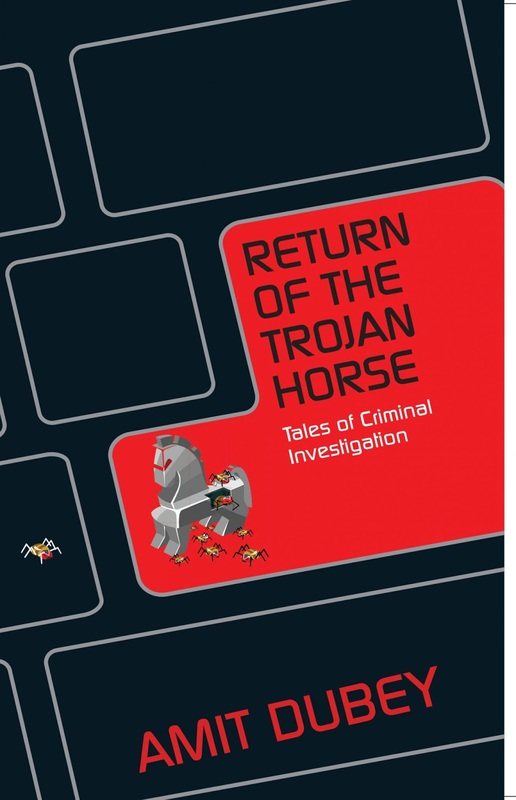 Return of the Trojan Horse is the riveting narration of how he is compelled to draw inputs from his personal life and use sharp thinking and advanced technology to solve the criminal cases he is brought into. Based on real life, the book reveals the next generation methodologies used in crime investigation. With the advent of internet and technology, our lives have changed drastically. We cannot imagine living a day without internet and our gadgets. Every facet of our lives is touched by technology; from the way we shop our groceries, plan our holidays, to how we book our cabs, movie tickets, etc. Whatever we do on the internet, we leave our digital footprints behind. While technology has made our lives easier, it has also made us more vulnerable. We live in a world where criminals and terrorists are using hi-tech methods and equipment to plan their acts. And hence it is no surprise that those involved in criminal investigations also use advanced technology and next generation methodologies to crack crimes cases. Return of the Trojan Horse – Tales of Criminal Investigation by Amit Dubey gives us a sneak peek into the world of crimes and criminal investigation and how big a role technology is playing in today’s time. Before I talk about the book, here is something about the author Amit Dubey that you should know. He is a well-known persona in the field of Crime Investigation in India and helps various police departments and security agencies in India to solve criminal cases. He is an IIT alumnus and a software engineer by profession. He speaks regularly at international conferences on cybercrimes and ethical hacking. He has also been featured by CNN-IBN as a National Security Expert. Given the author’s background, I had high expectations from the book as I felt that the author will be drawing in from his rich experience in the cybersecurity field and will have something interesting to share. The book didn’t just meet my expectations but surpassed it. There are three different fictional case studies in the book - one dealing with a terrorist attack, one involving a kidnapping case and one revolving around a hit and run case (although I do feel somewhere they do have some resemblances with real incidents). All of them are narrated in simple and easy to follow language. The author doesn’t aim to preach or educate you about anything – he just narrates you a story of criminal investigation and how with the help of technology he helped in solving them. The use of technical jargons is minimal and hence the storytelling never feels overwhelming at any point in time. As you go through the pages of the book, you will know how easy it is to track anyone who uses a smartphone and is connected to the internet. It is quite scary in a way that we are all oblivious to how vulnerable we all are in today’s time connected by technology. The narration in the book is crisp and to the point. Yet, it often evokes many emotions in the reader– at some point, you will feel angry, sometimes anxious and helpless and often you will feel a strong sense of patriotism. A good pick for anyone interested in reading stories from the field of cybersecurity, criminal investigation and ethical hacking. This book makes for a great gift for any book lover. So, this Diwali you can gift it to a book-loving friend of yours. I received a free copy of the book from Leadstart Publishers in lieu of an honest review.